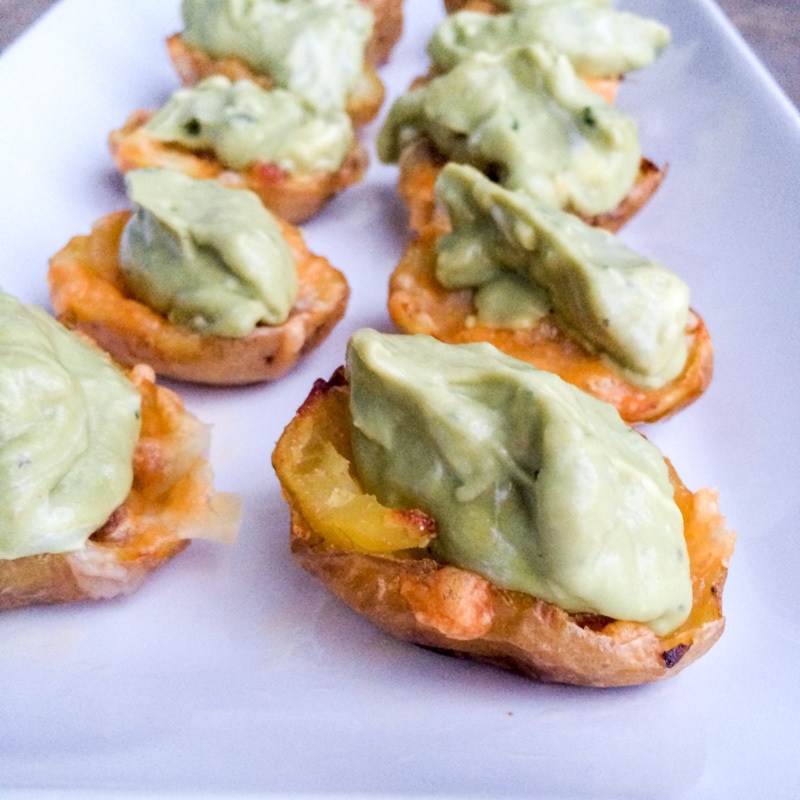 Creamy healthy Guacamole filled potato skins are great for a light appetizer for Game day! 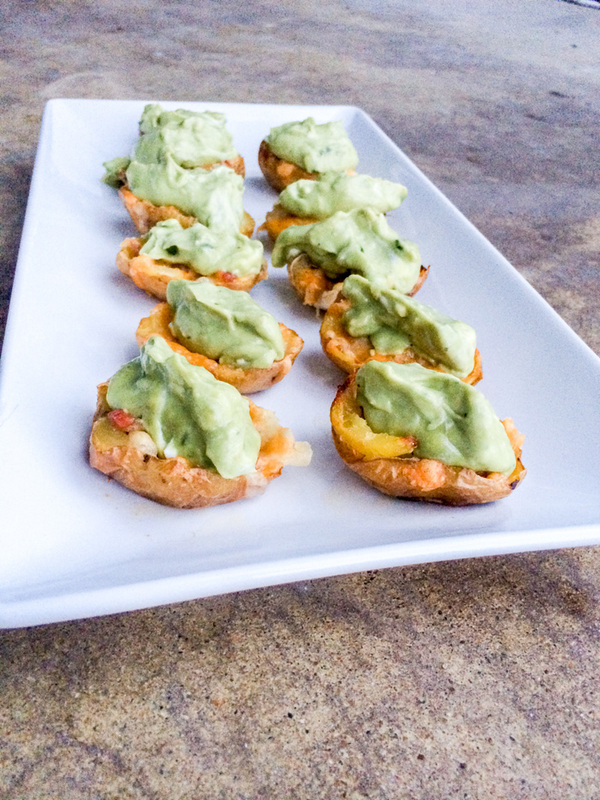 These Skinny Game Day Guacamole Potato Skins are the bomb! Top with onions, bacon or anything else to spice them up further. It’s Game Day! And there is no shortage of great food on any given game day. I am not a sports girl, I am not even a football fan. If you’ve been reading my blog for any length of time, you’d know I’m not much of a sports fan to begin with. So why am I excited about the super bowl? Or any game day for that matter? This year I am heading to a friends for the Super Bowl, and I’m taking along a big batch of these I made up this morning. I know they will be a hit! These Skinny Game Day Guacamole Potato Skins are the perfect addition to any game day fare! 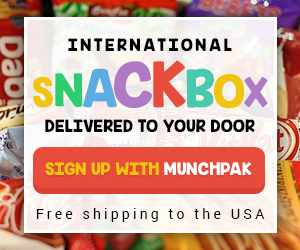 And they are super easy, can be changed up in so many ways and are bite size which makes them even better! Plus they have avocado. And avocado (or guacamole) might just be my one weakness. I can eat avocado daily and never tire of it! I will warn you. Make lots of these. They go super fast! I’ve made huge platters of them before and within 15 minutes of setting them down, they were gone! I always prepare some extra potatoes ahead of time so it’s not too hard to whip up another big batch. Even the guys love these, so be prepared. Ready to make up some Skinny Game Day Guacamole Potato Skins? Clean the whole potatoes, dry and rub olive oil around them. Place them on a baking sheet and bake for 35 minutes or until you can press gently and feel they are tender. Remove them from the oven and allow them to cool until you can handle them. Slice them in half, lengthwise and scoop out the flesh. Don't scoop it all out, you need "walls" to hold the potatoes up. I use a melon baller and run it through once to get a small amount. Save the extra potato in a bowl and make some mashed potatoes! Yum! Place each of the cut potatoes back on the baking sheet, with the flesh side facing up. Rub olive oil across the tops. Chop the Pancetta... and allow to crisp in a skillet over medium high heat. Fill each of the potato skins with a little bit of pancetta, then some shredded cheese. Pop them back into the oven for about 5-10 minutes, just until the cheese is melted. Remove and allow to cool just a bit. Top each potato skin with a dollop of guacamole, sprinkle the top with shredded cheese, onions or even more pancetta. Check out this week’s FANTASTIC Game Day Eats! These sound wonderful! I’m making both potato skins and guacamole for the game tonight and now I’m thinking I should just combine the two and make these! Thanks for sharing! Thanks Heather! They are so yummy and can be changed up in so many ways. Happy Super Bowl! Nichole, Pancetta is my new staple these days, I totally get that. haha the combination of the three is amazing! Thanks! I love potato skins. I have tons of potatoes on hand so I might just have to whip up a batch today. You totally need to, if you didn’t yesterday, then tomorrow. 🙂 haha Thanks hon! ooooh!! I could maybe be convinced to watch football if these beauties were being served! YUM! oh my goodness! I love these!!! slathered with guacamole. . love it! Thanks so much Alee 🙂 So good! Man I wish I didn’t already shop for the game tonight!! I WANT THESE NOW. I too could put Avocado on anything why not a potato skin, it’s brilliant! Oh and I’m all about the food and commercials teehee!!! Enjoy! 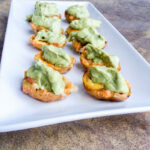 Nicole, I was just so close to making potato skins for this week’s Sunday Supper, however, you get a big high five for being so creative to make them healthier with the addition of guacamole! I love this! 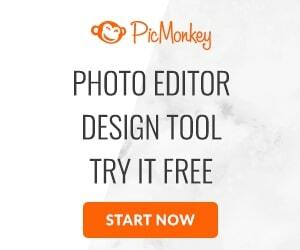 PS: On your side bar, you have something about “St. Louis Happenings”….are you from St. Louis? I lived there for 3 wonderfully happy years and my daughter was born there! I am from St. Louis. I currently live in St. Charles. 🙂 Where are you now? What a great idea! I would love a plate of these little potato skins! Yum! 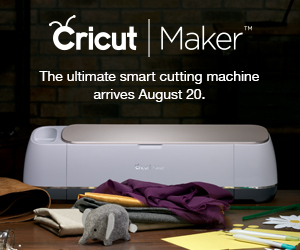 Wow, what a terrific idea!! My hubby would go nuts over these, I’ll have to try them sometime! Thanks! You’re quite welcome Julie! I hope your husband loves them too! Those look incredible, I love them!!! 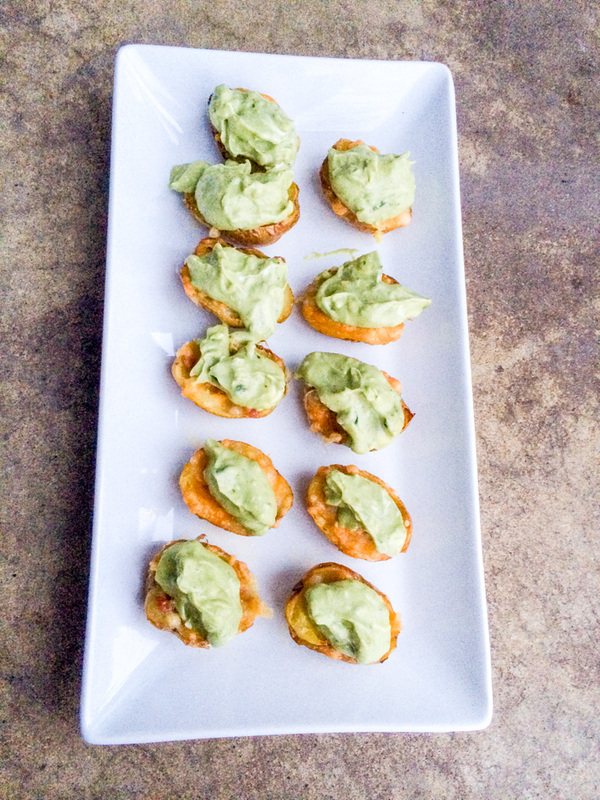 Love me some tater skins…and GUAC! Great combination! So many great ideas for the big game today and this is right there at the top for one of my favorites. Pinning this one. The game day treats were AMAZING! Such a fantastic selection of recipes, I know I will be making a ton! Thanks Lea Ann!! Pancetta and guac? I can see why these are the first things to disappear at a party! The perfect pairing! 🙂 Thanks Courtney! I am such a guacamole addict lately. I used to love potato skins too, but haven’t had them in forever. I need these in my life!!! haha Laura, you will love them!! Thank you! I love that you did this with baby potatoes!!!! And with the guac, they’re perfect. Pinning!!! I love the mini size of the smaller potatoes. Just easier and perfect for game day. Thanks so much hon! Potato skins AND guacamole? Sign me up! These sound delish! yes and yes! Can it get any better? Thanks hon! O-M-G Nicole….I HAVE to make these!!! LOVE, LOVE, LOVE!!! Oh, wow, do these look fantastic! As a guacamole lover, I’d do my part in making a batch of these disappear! These are so cute! Perfect little appetizers. Aw, thanks Shannon! 🙂 They were perfect! This a very smart recipe, Nicole. Seriously loving how you used pancetta instead of bacon. And the gold potatoes too. Just pass me the platter please! I would happily share this with you my sweet friend. Thank you!! And yes lately I’ve been reaching for the Pancetta instead. More flavor and healthier option. My coworker will love this! Yes please. These look totally delicious and such a nice twist on a traditional skin. Anything with guac is my first choice! Ahhh I am so sad. I just recently developed a serious allergy to avocado. Guacamole was one of my favorite game day foods. I would have eaten a whole batch of these!! Great recipe! Did you say Pancetta? Love it and I think it makes everything better! I did say Pancetta. I’m addicted lately. 🙂 Thanks hon! Omg these is the best combination of appetizers ever! Guacamole is my ultimate weakness, and on a crispy potato skin?!? Woa. Why oh why have I never put guacamole in a potato skin before?! They look so cute and must taste amazing!